Tom Boomershine knows that it’s tough to find, and keep, “The One.” And in “After Ever After: Finding and Keeping the Love of a Lifetime” (published by Archway Publishing), written with his wife, Winter Boomershine, he gives some practical, solid advice on how to do both. The book focuses on ways to recognize the person one can love forever and how to maintain a great relationship. 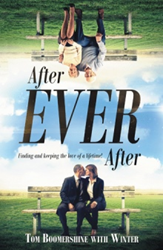 Although Tom Boomershine is a United Methodist pastor, “After Ever After” is written for all faiths, spiritualties and sexual orientations. He wants to encourage people to engage in their own deepest values and spirituality when looking for a partner to share life with. Tom Boomershine counsels one on how to avoid overcommitting before discovering the love of their life. He also imparts two bedrock foundations he believes make or break a marriage and ways to protect a relationship from falling apart. Tom Boomershine has been a United Methodist pastor for over 20 years and is currently the pastor of DeWitt United Methodist Church in DeWitt, Iowa. His hobbies have ranged from music, brewing beer, reading and writing, storytelling, weight lifting and other forms of exercise. At 50, he realized that in order to do anything well he must focus. As such, the martial art Aikido became his primary hobby. Tom Boomershine is the founder and owner of EcoSphere Coaching, a life, executive and organizational coaching practice focusing on using Judith E. Glaser’s communication intelligence to build bridges across personal, cultural and organizational communication barriers. His wife Winter was his primary partner in writing “After Ever After.” Together they have three children and two grandchildren.